Spanish, French, Mandarin or Latin. We can’t wait for summer (for lots of reasons, but especially for this fun-filled and incredible language class opportunity). We’ve invited some of the world’s greatest language teachers to come to White River Junction, Vermont to teach with us this summer. This is an opportunity not to be missed! All of the following classes are open to adults, middle and high school students. Elementary French is for kids ages 6-11. Open to students ages 12-adult. Allison Litten of Norwich, VT will teach French to students ages 7-11. (Older or younger than that? Talk to us.) Allison is Vermont’s Foreign Language Teacher of the Year. Tina Hargaden joins us from Portland, Oregon where she teaches middle school French and Spanish. She’ll be teaching French to students ages 12- adult. Justin Slocum Bailey of Indwelling Language joins us from Ann Arbor, Michigan will teach Latin to students ages 12-adult. Beginner Latin Tuesday-Thursday, Intermediate Latin on Friday. Linda Li will teach beginner Mandarin to students ages 12-adult. Think learning Mandarin sounds hard? Not with Linda Li! Coming from out of town? More info on lodging options coming soon. World language teachers will be observing these classes as part of our summer teacher training programs. 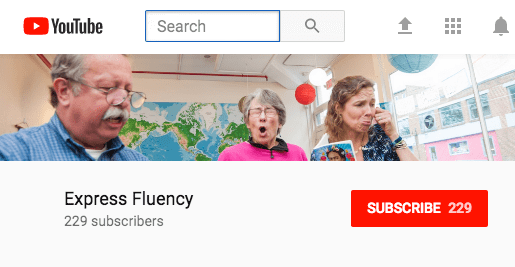 Watch a video from 2017’s language classes and teacher training. This video was made to explain the program to language teachers, but it will also give you a sense of our language classes. Elissa founded Express Fluency in 2012 to bring Comprehensible-Input based language classes to adults. Tired of hearing (almost) everyone say “I studied (fill in the blank) language in school for 4 years and I can’t speak a word now” – she decided to be part of a movement to change that. She holds a Masters degree from the Harvard Graduate School of Education and has taught Spanish to students from preschool to college and adults. Prior to teaching Spanish full-time she co-founded two innovative expedition-based high schools. She loves to travel, meet new people, hang out with her 13-year old daughter, and help bring more joy and multilingualism into the world. Justin Slocum Bailey is crazy about helping teachers and learners succeed with less stress and more joy. A veteran language, music, and martial arts teacher, he operates Indwelling Language, a treasure trove of resources and low-prep practices for joyful language education, while consulting for schools, districts, publishers, travel companies, and non-profits worldwide, with characteristic kindness, humor, and outside-the-box thinking. Justin was raised in Vienna, Austria, but now lives in Michigan, where he thrives on fingerstyle guitar, jujutsu, and Detroit Tigers baseball. Tina Hargaden recently transitioned to teaching high school ESOL in Portland Public Schools (Oregon) after teaching French, Spanish, English Language Arts, Social Studies, and Reading Intervention in public middle schools in the Portland area for thirteen years, and she has enjoyed (almost!) every minute. She loves the creativity, community, and smiles that proficiency-based teaching brings to her classroom each day. Tina loves sharing and learning with colleagues all over, and she has presented at many conferences and workshops. She has organized the Comprehensible Cascadia conference in Portland, OR for the past three years, and she designed and directs the World Language Proficiency Project’s Summer Institutes. Recently Tina collaborated with Ben Slavic on a book called A Natural Approach to the Year. Tina has a firm belief that everyone can be successful with CI strategies, teachers and students alike. and high school students as well as adult learners for over 15 years. urban school in Denver, Colorado. Allison Litten grew up in Scituate, MA, where, in high school, she became interested in the French language and culture. She began her teaching career in 2000, immediately after having graduated from Williams College with a double major in French and sociology. She taught high school French in Brookhaven, MS, while simultaneously pursuing an MA in Curriculum and Instruction at the University of Mississippi through the Mississippi Teacher Corps. In the summer of 2003 Allison moved to the Upper Valley and began teaching at the Marion Cross School in Norwich, VT. She has been here ever since, loving her job more as each year passes. She loves her students and having fun, singing songs and being silly. She completed her M.A. in French at Middlebury College in 2010, spending her final semester in Poitiers, France, and has traveled to France on numerous occasions since. This school year Allison is teaching French to kindergarteners and first, second, fourth, and sixth graders. She really enjoys having the opportunity to work with the various age groups. Her experience in each grade is totally different and she’s constantly in awe of what her students can do at each level. (Check out her Instagram to see photos and videos of her classes in action.) Allison blogs about her classroom experiences and ideas at cicanteach.com. Allison served as Co-President of the Vermont Foreign Language Association (VFLA) from 2012-2018 and was a board member from 2006-2018. Outside of school, Allison enjoys spending time with her family, friends, and dog, traveling, watching movies, running road and obstacle races, cooking vegan food, and reading. Joseph Dziedzic, well experienced in presenting, mentoring, and researching best practices in CI , is currently teaching Spanish at Aspen High School in Aspen, CO. His passion and commitment to the CI methodology have led him to the development of CIteachers.com. He was awarded the “Jared Polis Teacher Recognition” and the “Mile High Teacher” for his commitment to world language education at the state and district level. Joseph has presented on numerous occasions, for example, at the iFLT Conference in Breckenridge/San Diego/Denver/Chattanooga and a multitude of other professional development workshops.